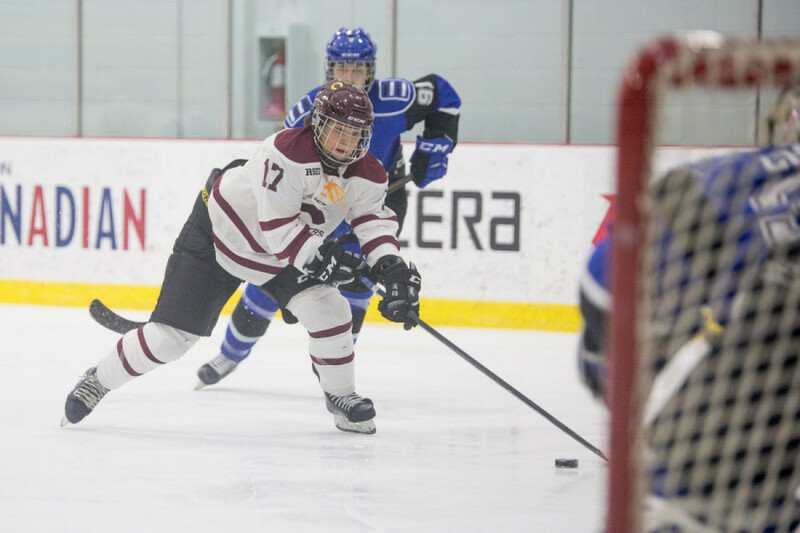 Sunday afternoon’s 3-2 overtime win over the University of Ottawa Gee-Gees marked the last time six Stingers women’s hockey players would take the ice in a regular season game as members of the program. Audrey-Anne and Marie-Joelle Allard, Alexandria D’Onofrio, Keriann Schofield, Carole-Ann Gagné and Frédérike Berger-Lebel were honoured after the game for their careers at Concordia. To say that all six of their careers at Concordia included high peaks and very low valleys would be an understatement. All were members of the team when it could hardly muster eight wins. 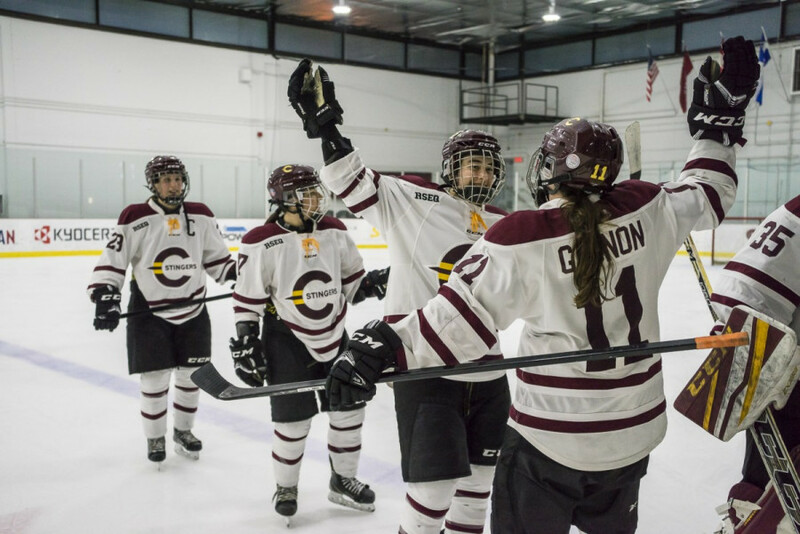 After completing their second consecutive double-digit win season, their victory over the Gee-Gees is a culmination of the program’s renaissance under head coach Julie Chu. “It all pays off,” she continued. The infusion of talent coming into the program over the past few seasons was on full display against the Gee-Gees. One thing that Claudia Dubois, Audrey Belzile and Sophie Gagnon—the three goal scorers this Sunday—have in common is that they developed under the tutelage of Chu and her staff. Related: Stingers Complete Comeback Win Over Gee-Gees. Another thing they have in common? They’re three of Concordia’s most productive players, owning three of the team’s top-four point totals. “They did amazing, they came back even stronger than last year,” said Tracy-Ann Lavigne, last year’s team captain and now a member of the Canadian Women’s Hockey League’s Les Canadiennes de Montreal. “We finished well last year but this year they finished second and they’re just killing it. I’m really proud of all of them,” she said. 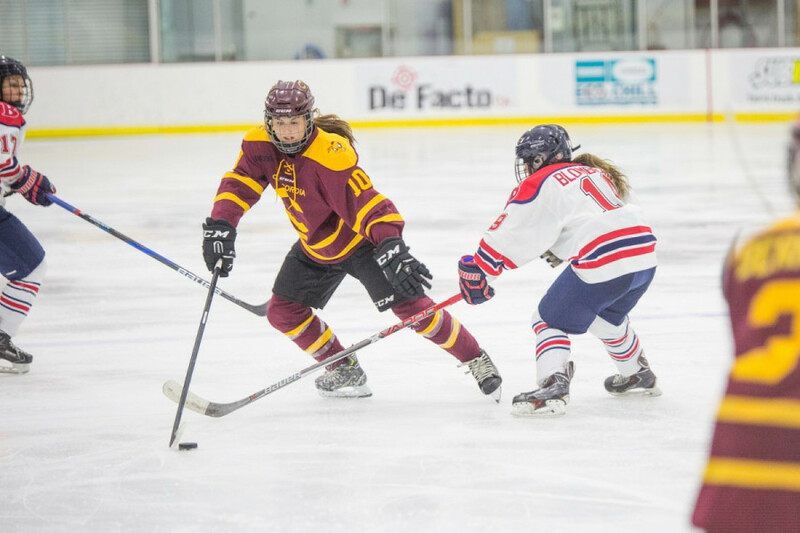 Concordia’s women’s hockey team hadn’t finished as one of the top two teams in their division since finishing first in the 2004-05 season. Over the last 12 seasons, they’ve finished last place six times and were never a factor in the postseason. In her first season as the team’s full-time head coach, Chu coached the Stingers to a ten-win campaign, finishing third in the Réseau du sport étudiant du Québec and ousting the second place Université de Montréal Carabins from the playoffs before losing to McGill in the finals. She followed that quick turnaround with a 14-win season this year, narrowly finishing second in the standings to the Carabins. Now with the regular season squarely in their rear-view, the Stingers prepare for their next test. On Thursday night at Ed Meaghar Arena, they open a playoff series against the very same Ottawa Gee-Gees, a team they’ve had tough battles with all season. Chu thinks that her team is comfortable playing in tight games. She trusts that the mental and physical preparation they did during the offseason will pull them through any situation. Related: Katherine Purchase Running for CASA’s VP Academic. Ottawa has gotten the best of the Stingers three of the five times they’ve played this season. The team knows not to take anything for granted, especially with a chance to advance to the national championship playoffs on the line.